What is the Ship Recycling Convention? As of end of January 2019, Norway, Congo, France, Belgium, Panama, Denmark and Turkey have acceded to the Convention. Furthermore, the European Regulation on Ship Recycling entered into force at the end of 2013. It may promote ratification of the Convention, especially in Europe. What is the Inventory of Hazardous Materials? The Inventory of Hazardous Materials (IHM) is a list of hazardous materials, waste and stores in a ship. It identifies their location and approximate quantities onboard the ship. As shown in the table below, Part I of the IHM is developed at the design and construction stage, and Part II and Part III are developed before a ship is recycled. However, Part I of the IHM for existing ships, whose building contracts have been placed before the entry into force of the Convention, is developed not later than 5 years after the entry into force of the Convention. The information provided by the IHM is utilized by ship recycling facilities in order to protect human health and safety and prevent environmental pollution. ClassNK provides the following solutions so that stakeholders including shipowners, shipbuilders and suppliers can smoothly implement the requirements of the Convention after its entry into force in the development of the IHM for new ships. Shipbuilders should develop the IHM for new ships in accordance with the format stipulated in the IMO Guidelines and based on the information obtained from the Material Declaration (MD) and Supplier’s Declaration of Conformity (SDoC) submitted by suppliers. In order to develop the IHM for new ships, shipbuilders and suppliers have to exchange and store a huge number of paper documents. It may be a serious burden for shipbuilders and suppliers. ClassNK developed “PrimeShip-GREEN/SRM” to facilitate IHM development utilizing a Cloud Computing System in cooperation with IBM. After registration to the system via Internet, the people who engaged in the development of the IHM, including shipbuilders and suppliers, are able to perform all necessary work for IHM development on the system website. 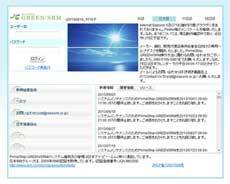 For registration to “PrimeShip-GREEN/SRM,” please access the following URL, click “Register Organization” on the login page and input the necessary information. ClassNK provides following formats and documents. Please download and use them freely. The Hong Kong Convention requires establishment of a system to maintain Part I of IHM during operational life of a ship. This is an example of the procedure for such system, assuming designation of a responsible person on shore. ClassNK issues SOC for Part I of the IHM developed in preparation for the incoming Convention. SOC will be smoothly converted into an International Certificate on Inventory of Hazardous Materials after the entry into force of the Convention. ClassNK recommends the early preparation of the IHM because the need for experts is expected to increase drastically after the entry into force of the Convention. After the entry into force of the Convention, ships shall only be recycled at ship recycling facilities authorized in accordance with the Convention. Ship recycling facilities will be required to develop a Ship Recycling Facility Plan (SRFP) to be authorized by the competent authority. ClassNK issues a SOC to ship recycling facilities which verifies that they are in compliance with the Hong Kong Convention, after confirming that the SRFP developed by the ship recycling facilities meet the requirements of the Convention and that the facilities are carrying out recycling procedures in accordance with their SRFP. ClassNK has issued a SOC to the following ship recycling facilities so far. 1 Facility name: Dalian Shipbuilding Industry Marine Service Co., Ltd.
2 Facility name: RL Kalthia Ship Breaking Pvt. Ltd.
3 Facility name: Priya Blue Industries Pvt. Ltd. Facility name: Shree Ram Vessel Scrap Pvt. Ltd. and Shree Ram Shipping Industries Pvt. Ltd. Note: Shree Ram Vessel Scrap Pvt. Ltd. and Shree Ram Shipping Industries Pvt. Ltd. are adjacent two ship recycling facilities and are operated by one management body in accordance with the Ship Recycling Facility Plan (SRFP) which is common to both of them. 5 Facility name: Leela Ship Recycling Pvt. 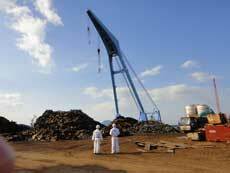 Ltd.
9 Facility name: ISIKSAN SHIP RECYCLING and TRADING Co. Ltd.
16 Facility name: TRIVENI SHIPBREAKERS PVT. LTD.
24 Facility name: NBM IRON AND STEEL TRADING PVT. LTD.
25 Facility name: SHUBH ARYA STEEL PVT. LTD.
26 Facility name: LEELA GREEN SHIP RECYCLING PVT. LTD.
27 Facility name: P. RAJESH SHIP BREAKING PVT. LTD.
28 Facility name: SACHDEVA STEEL PRODUCTS (SHIP BREAKERS) LLP / JAI JAGDISH SHIP BREAKERS PVT. LTD.
29 Facility name: SAI INDUCTOMELT PVT. LTD.
30 Facility name: SALASAR BALAJI SHIP BREAKERS PVT. LTD.
Information in this table is based on the SRFP developed by the ship recycling facilities. *2： The image shown here is not a true copy of the certificate. However, the content is identical. ClassNK published “Guidelines for Ship Recycling Facilities” in order to clarify the procedure and requirements for issuance of the SOC. The Guidelines can be download from “ClassNK MyPage” after the registration as a user. For more information, please contact us to the following.